Cobblers let a late lead slip as their four-game winning streak at home came to an end on Saturday when held to a frustrating 2-2 draw by lowly Grimsby Town. A strong start by the Cobblers was rewarded by Andy Williams’ thumping early finish, but failure to take several chances thereafter was punished by Charles Vernam’s leveller late in the first-half. Town would have been kicking themselves at half-time after letting a position of strength slip, and it have got worse in the second period when they struggled to regain their supremacy of the opening 45 minutes. The second-half was a messy affair for the most part but it exploded into life in the final 15 minutes when Kevin van Veen’s free-kick was cancelled out by Harry Cardwell before Mariners captain Danny Collins saw red in the final moments. Nevertheless, Grimsby held on for what was a worthy point as they capitalised on a Cobblers team who will be frustrated on two counts; first their wasteful finishing in the first-half and then their sloppy play in the second. 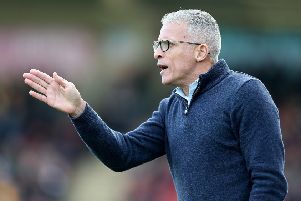 There was a change of formation for the visit of Grimsby as Keith Curle returned to 3-5-2, with Ash Taylor making his first start in almost two months and Sam Foley thrown straight back in having served what was, in effect, a four-game suspension. Another player returning to the side was Williams and he required only four minutes to make his mark. Like last week, the goal came from another David Buchanan corner but, unlike at Exeter, there was no doubt about the scorer of this one. Buchanan delivered a low cross that Foley did well to keep alive before Taylor’s header dropped to Williams at the back post and he thumped the ball into the roof of the net to hand Town the perfect start. It was no more than the Cobblers deserved for a dominant opening to the game too, and they almost had a second five minutes later when a Grimsby clearance fell to Kevin van Veen, whose shot was well-blocked at close quarters. Although Town’s strong start waned a little as the first-half progressed, the majority of the action came in Grimsby’s half as Buchanan’s fierce half volley was palmed behind by James McKeown. Taylor saw a strong penalty shout turned down after going flying over in the box and Sam Hoskins arrowed a first-time shot just wide as Northampton remained on the front-foot. Buchanan was inches away from reaching van Veen’s cross and doubling the home side’s advantage 10 minutes before half-time but, seconds later and totally against the run of play, Grimsby were back on level terms. Vernam was left unmarked to bring down a deep cross at the back post and he cut inside two defenders before shooting low beyond David Cornell. That prompted a change of mood around the ground and gave Grimsby a new lease of life, with the visitors close to scoring again moments later but Hoskins came to the rescue, clearing Jake Hessenthaler’s header off the line. After a brief wobble, Cobblers regained the initiative to end the first-half on top and they would have had the lead back at half-time if not for the brilliance of visiting keeper McKeown, who was at full stretch to tip Williams’ header onto the post. Northampton were slow to get going in the second-half and that prompted Curle into sending on Shay Facey for Jordan Turnbull in an attempt to kick them iinto life. Daniel Powell was also introduced but there was little change to the pattern of the second period, which was characterised by sloppy mistakes and the inability of either side to take the game by the scruff of the neck. A goal at this point appeared highly unlikely, but one sweet strike of van Veen’s right foot put Town back in front and on course for all three points with 15 minutes to go as his 25-yard free-kick, won for a foul on Foley, crashed into the bottom corner. Northampton’s joy was short-lived again though when Grimsby won a free-kick of their own and a catalogue of errors allowed Cardwell to crash home from close-range. Grimsby missed a great chance to hit the front when Ahkeem Rose planted his free header over, before they were then reduced to 10 men after Collins saw red for hauling down van Veen as the last man. Van Veen sent the resulting free-kick hurtling over the angle of post and bar and Cobblers could not take advantage of the extra man in the remaining time, as they were made to settle for a share of the spoils when more was well within their grasp.